This part creamy, part chunky loaded potato soup is the ultimate comfort food for fall and easily whipped up in the Instant Pot! Loaded chunky potato soup. I can’t even point out my favorite word in that sentence – I just love them all. 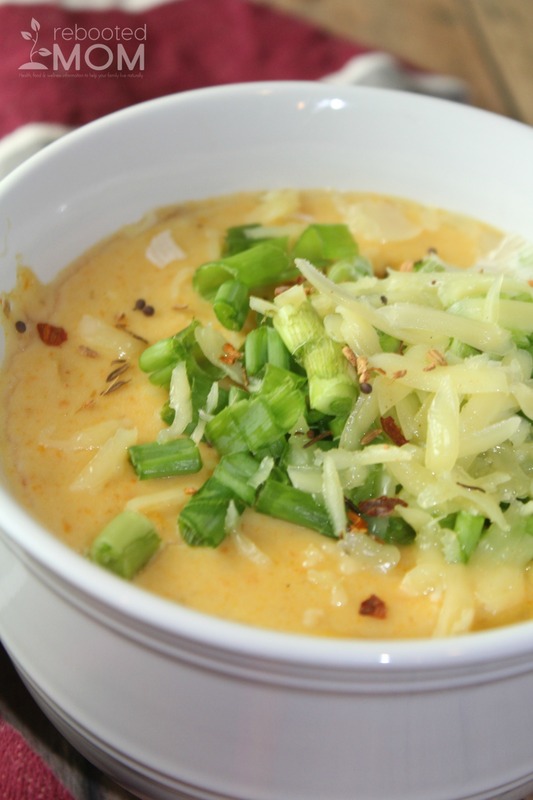 Loaded chunky potato soup is one of life’s most popular comfort foods. It’s all I can think about as we welcome fall and nights start to cool off. This soup is creamy, slightly chunky, full of flavor, and topped with all the best garnishes. We have green onions from the garden out back, and a little aged, organic gouda cheese. Definitely amazing – even more amazing with a few fresh slices of sourdough bread. Lately I have been cutting up sourdough to make homemade croutons – then putting those on top as well. I have to admit that of all the comfort foods out there, this is by far my favorite! Breakfast, lunch, dinner … I could eat this all day long. Who needs anything else when you have potato soup? If you have an Instant Pot, then all the better ~ because it’s literally an easy meal. There is no denying that we love our pot, it makes our dinners a breeze almost every, single night. This soup is easily made in the Instant Pot – though if you are without an Instant Pot it’s totally doable on the stove top as well (with a few minor changes). If using the Instant Pot, use the saute feature to saute the carrots, onions and garlic for 3-4 minutes until the onions are clear. Turn the saute feature off and add the potatoes and broth. Lock the lid on the Instant Pot & seal the valve. Cook the contents on manual (high) pressure for 10 minutes. Once you release the pressure, stick blend the contents being careful to leave some chunky potatoes remaining. Add the heavy cream, and season with salt and pepper. Serve in bowls with shredded cheese, green onions, croutons and even chopped parsley. Or, go all out and slam on that bacon. You know you want to! Enjoy this comfort food – it’s perfect for cold evenings! Use the saute feature to saute the carrots, onion and garlic in butter for 3-4 minutes until the onions are clear. Turn the saute feature off. Add the potatoes and broth to the items in the Instant Pot. Put the lid on the Instant Pot, and set the pot to Manual (High) for 10 minutes & ensure the valve is closed completely. Once the pot beeps, release the pressure, and use your Immersion Blender to blend half of the contents (you want half to be creamy and half to be chunky). If you don't have an immersion blender, remove half of the pot and blend, then pour back in. Add the heavy cream, and season with salt & pepper. Garnish with green onions, shredded cheese, croutons and parsley - if desired. Store leftovers in canning jar and refrigerate. Enjoy within 72 hours. This loaded chunky potato soup is best served with toasted sourdough bread or English Muffin Bread. I always love to double the recipe and store the second half in quart canning jars to give to family or friends who might appreciate a homemade meal. 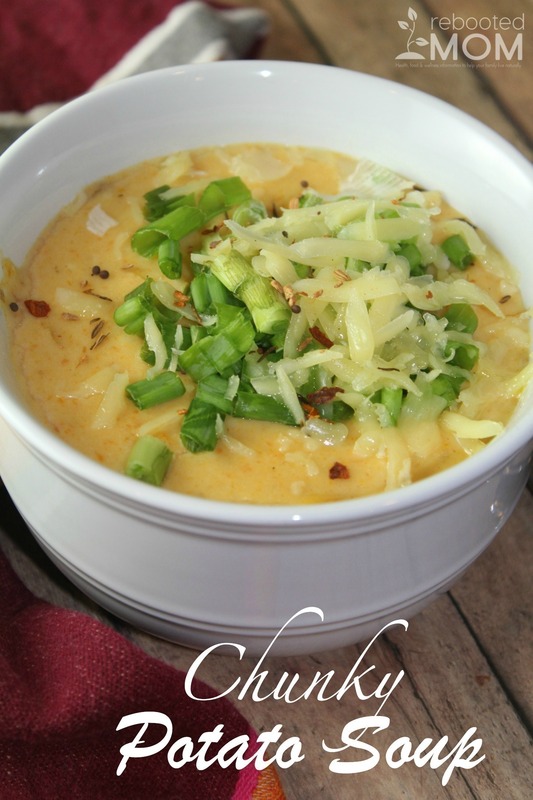 Share the post "Loaded Chunky Potato Soup"